Unfortunately there is only rudimentary information about this tour. 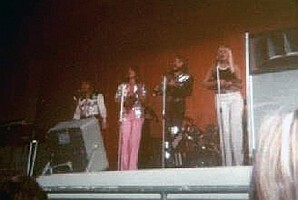 ‘ABBA’ toured as Björn, Benny, Agnetha & Frida. The reception of the shows apparently was good. During the weeks ABBA often worked in the studio on their own music or for other Polar artists. In the end of 1972 En hälsning till våra parkarrangörer was recorded, a single which was produced for park managers to promote ABBA and other Polar artists and their tours. Most of the venues according to the information in ABBA The Book, but ABBA did 80 concerts between June 15 and September 9, mainly on weekends with up to four venues per day. Through other sources and internet research several of the missing venues could be traced, but some still are missing. The reviews were polite if not unduly enthusiastic, although this didn’t seem to matter much to audiences who simply couldn’t get enough of Sweden’s number one hit group. As for their own feelings, Björn and Benny in particular had seen all they needed from folkparks of the country. While Björn & Benny, Agnetha & Frida were certainly wise to build on the momentum of their new-found success, and Benny avowed that they all shared a nostalgic longing for the park circuit, the reality was that being onstage no longer held any special attraction for the male half of the group. In addition, they were obliged to spend their between-gigs weekdays producing records by dance bands, religious singers and children’s choirs, to name just a few of their chores that summer. There are happy memories of this tour, but it was time for it to come to an end because we were all exhausted. I lost 7 kilos. When you realize that sometimes we did even three shows on the same day, it was madness. When Friday comes and I have to leave her [Linda], I just sit and cry. Cramming myself into a bus and tearing away to some folkpark stage is the last thing I want. But what can I do? If I stay at home the whole show will collapse. Everybody else will be without a job. The set list included pre-group songs and songs from the Ring Ring album. The songs marked with ‘?’ may have been there. This list does not reflect any actual and confirmed order.